The Premier Rank 1 offers to 10 percent interest on a deposit of one year. Assuming (i) annual, (ii) half-yearly and (iii) quarterly frequency of interest compute the effective rates of interests in the three alternatives. 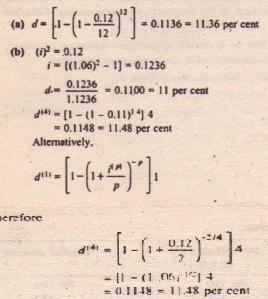 Solution Assuming a deposit of Rs 1.000. the computation of the effective rates of interest is shown below. Assuming [a) i = 0.0125 and (b) i” = 0.1025, find the values of (1) i” and (2) i12”. Similar to the relationship between the nominal and effective rates of interest, the mathematical relationship between effective and nominal rates of discount is given by Equations 2.A.4 and 2-A.5. The nominal rates or interest and discount rate employed in computing the present value or annuities payable P-thly.